Today I would like to offer 10 quick tips to help extend the life of your RV and automobile lead acid batteries. Battery maintenance is not that difficult but always keep safety in mind when you work around batteries. Lead acid batteries contain sulfuric acid which is extremely corrosive and can cause severe burns or even blindness. The hydrogen gas that batteries produce when they’re charging is very explosive. When you work around batteries you need to wear goggles and gloves, remove all jewelry and do not smoke or use any open flames. Routine maintenance and recharging a discharged battery as soon as possible will extend the life of the battery. Sulfation will occur when a battery’s state of charge drops below 80 %, or 12.4 volts. Recharging a battery at an 80% state of charge will prevent battery sulfation. Never let a battery discharge below 10.5 volts. You can measure the voltage with a digital voltmeter. Measuring the voltage gives you a quick picture of the batteries depth of discharge so you know when they need to be recharged. Set the voltmeter on DC voltage and put the red lead on the positive terminal and the black lead on the negative terminal. Reducing the battery’s depth of discharge will increase the life of the battery. A battery discharged to 50 % everyday will last twice as long as it would if it’s cycled to 80%. 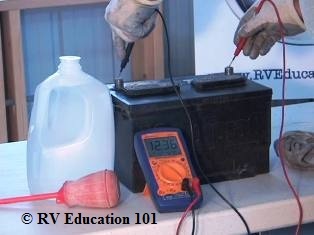 RV’s have parasitic loads that will discharge the battery over time. Some but not all of these loads are LP gas leak detectors, the TV antenna power booster, clocks, stereos and appliance circuit boards. 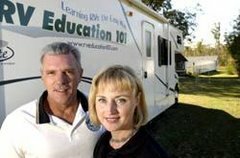 If your RV is equipped with a battery disconnect switch make sure it is in the OFF position when you are not using the RV or when it is in storage. 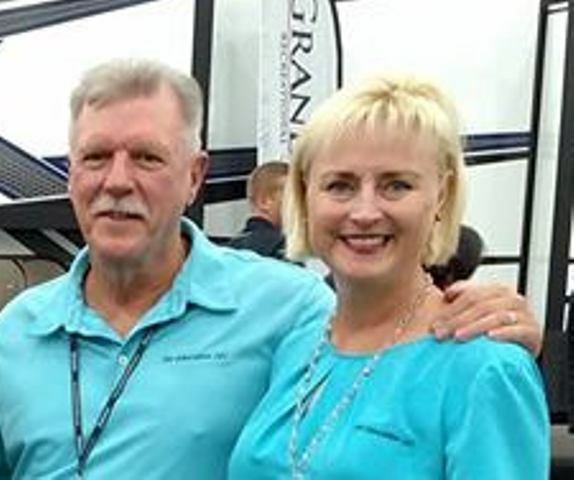 If your RV is not equipped with a battery disconnect switch you can purchase a battery disconnect that installs directly to the battery. Hot temperatures and overcharging kill batteries. During hot weather or during high usage check the batteries frequently. Checking the electrolyte levels and adding distilled water as required can save your lead acid batteries. When you add water to a battery, use mineral free water. Distilled water is best. Regular tap water can cause calcium sulfation. Properly charging your batteries needs to be done in stages. A bulk charge should be performed to return the battery to 90% of a full charge in the first few hours. An absorption charge is used for the remaining 10 percent to prevent any battery gassing and loss of water, and then a float charge to keep the battery fully charged. Batteries should only be watered after charging unless the plates are exposed prior to charging. The lead and plastic used to construct batteries can be recycled. More than 97% of all battery lead is recycled. Be sure and recycle your old batteries.